Be the first to share your favorite memory, photo or story of VERA. This memorial page is dedicated for family, friends and future generations to celebrate the life of their loved one. 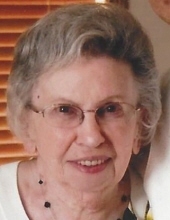 VERA M. SCHAEFER (nee Whale) age 88, beloved wife of the late Edward J.; loving mother of Edward T. (Patricia), Susan A. (deceased), Judith M. Sofia (Richard), John R. (Rita), Kathleen E. Dillinger (Howard) and Joseph R. (Donna); dear Grandmother of Beth, Eddie, and Amy; Kristen, Jenny, Katie and Brian; Sarah, Duke, Andy, Danny, Neil and Kathryn; David, Jon and Michael; Joseph, Jake and Jessie; Great Grandmother of 25; Sister of Florence McCracken. Passed away, Monday, October 22, 2108. Funeral Mass, St. Angela Merici Church (20970 Lorain Rd., Fairview Park) Monday, October 29th at 10:00 AM. Interment Holy Cross. Friends May Call at The McGORRAY-HANNA FUNERAL HOME OF WESTLAKE, 25620 Center Ridge Rd. (West of Columbia Rd.) SUNDAY from 12 – 5 PM. Family suggests memorial contributions to the National Multiple Sclerosis Society, Ohio Buckeye Chapter, 6155 Rockside Rd., Suite 202, Independence, OH. 44131 or Hospice of the Western Reserve. "Email Address" would like to share the life celebration of VERA M. SCHAEFER. Click on the "link" to go to share a favorite memory or leave a condolence message for the family.